It seems as though New York based singer Mary Wheeler only had one 45 issued under her own name but it is a real winner. 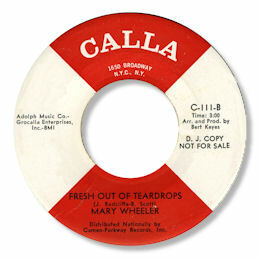 Her Calla 45 is fairly easy to obtain and "Prove It" has had dance floor fans for ages. But for me her killer track is Fresh Out Of Teardrops, a lovely deep soul song that shows her voice in a much more attractive light than the rather little girl style she adopted on her other recordings. The plodding horn lines and somewhat jazzy waltz time drumming are the best bits of the backing track - but the key part of the whole 45 is Mary's desperate pleading. Great to see Jimmy Radcliffe's name as co-writer. UPDATE ~ Pete Nickols writes to say that he has been in touch with Mary herself and she has very kindly supplied a lot of further details about her life in the music industry. 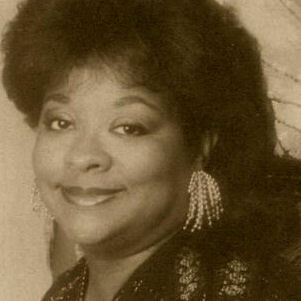 She says that "I spent time recording with Bobby Robinson, Bunny Jones and a myriad of others." But nothing seems to have been issued. She goes on to give these details about her involvement with the notorious Nate McCalla and her recording for his label. "I was Executive VP of Calla and had the unfortunate task of closing Nate's office in the Gulf-Western building (and dealing with the IRS) when he disappeared while before he was killed. I started out as Nate's Admin Assist when he had a small office at 1650 Broadway. He was impressed when he met me at a session that I happened to be attending and I took shorthand notes of an impromtu song the producer wanted to do. I eventually wound up running his office, but he only allowed me time to record/tour to keep me appeased. He really did not want to let me out of the office. I did only a few local gigs (and one in Canada) as a solo artist. Nate was handling The Tiffanies, and when Eula McNair quit abruptly - leaving Roberta Rivers and Mary Seymour Williams, nee Young, in a lurch, I stepped in (and became the lead singer). I toured extensively with The Tiffanies (my first European tour was with them - for Carson Holmes) and The Crystals. Also worked in Florida for a short time as lead singer for a group called Deja Vu for a promoter named Tony Belmont. Crystals and Marvelettes were later incarnations. Dee Dee (Kennebrew) was (and still is-as far as I know) the lead singer of the Crystals. I hear she is singing with her grand- daughters!!! By the way, that group included Roberta Rivers who was the spokesperson for The Tiffanies." I'm really grateful to Mary for all the fascinating info she has passed on, and of course to Pete Nickols for pulling it all together. What desperatey sad news. All our thoughts are with Andrea and Mary's others family members at this time. Note ~ Mary has confirmed that the 45 by Mary Wheeler & the Knights on Atom is not her.